5793 labyrinths found. Showing 261-280. Sorted by country, state, city, then zip/postal code. The 'Yew-Rock' Labyrinth - gradually growing. North driveway before the yellow letter box travelling south along 248th. On our main street (Railway Ave) just past Friendship Auto. 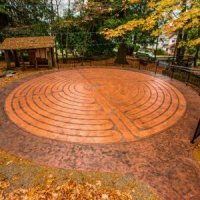 11 Circuit Labyrinth created by the Xenia community on Sept. 17th 1997. Summer Months: 7:00 am - 10:00 pm. Winter Months: 8:00 am - 5:00 pm. It is on private property but Angelyn Toth the owner/founder has made it available to the public. From Vancouver head past Whistler to Pemberton then to Lillooet - fill up on gasoline there - through Gold Bridge to Bralorne. Follow signs for the Bralorne Pioneer Museum and you'll see the labyrinth beyond. Aryana lives nearby so do call or ask for directions. Cell phones do not work here. If you are adventurous, in summer you may take a logging road from Pemberton to Bralorne. This outdoor labyrinth is surrounded by cedar trees and adjacent to a park and pickle ball courts. It is on the property of the Castlegar & District Community Complex and is accessible when the Complex is open. A key to the gate may be obtained at the information desk. 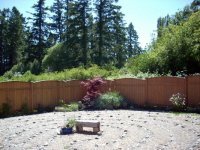 This simple free-style rock labyrinth may be found on the east side of Zuckerberg Island located in downtown Castlegar. 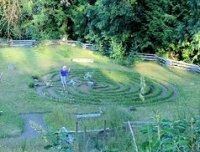 Artist's view through railing on one side of Chemainus Labyrinth. 48.55' N° Lat. ; 123.42' W° Long. 7 circuit design of bermed earth & wildflowers adjacent to lavender field with nearby gazebo. 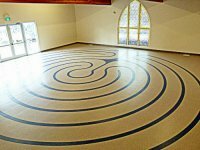 Labyrinth is open for special events and by appointment. 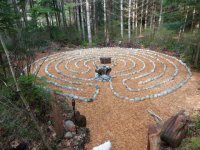 In beautiful park-like garden on the edge of Seal Bay Park, this heart-shaped, three-circuit Classical Labyrinth of beach cobbles and bark mulch is planted with low-growing aromatic herbs. 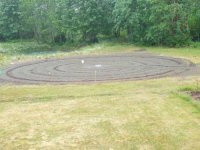 Built on the first World Labyrinth Day, May 2, 2009, it is 23' in diameter. 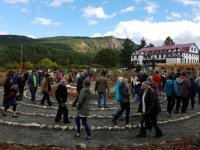 Visits by appointment and walkers are invited to bring a stone or low-crowing herb like Woolly or Elfin Thyme, Corsican Mint to plant into this living labyrinth community quilt. 49 38 05. 7 N° Lat. ; 124 57 05.76 W° Long. In the heart of Ladner Village, a short drive from BC Ferries (Tsawwassen terminal) and 20 minutes from Vancouver Airport. Follow Tzhouhalem Road eastward until you come to Providence Farm Road on your left. Turn in and follow it to the Farm. Watch for horses and people. The Labyrinth can be accessed through the St Ann's Garden gates. Please close the gates after 3pm as the deer will eat everything! There is a path alongside the allotment gardens that leads directly to it. amazing views of the Hoodoos and the Rocky Mountains while you visit. Note: July 2016. 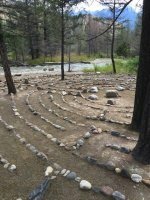 Recent spring flooding has changed the access to the Dutch Creek Labyrinth in Fairmont Hot Springs. Walk from trailhead takes about 5 minutes. Starting at trailhead, west end of Teal Road, in the Dutch Creek subdivision of Fairmont Hot Springs, walk approx. 200 feet west following blue tape markers then angle north towards riverbank. A short walk east leads you to a steep trail down to the labyrinth. Fortunately the ice covering the tallest centre stone did little damage this past winter! Private residence in 8900 block Gay Street (West side), Fort Langley in Langley Township. Three streets west of Glover Road, North of 88th between 88th and Houston. Located in the private garden of Myrna Pfeifer and Doug Sturrock who require prior notice of your intentions to walk about. Thank you.